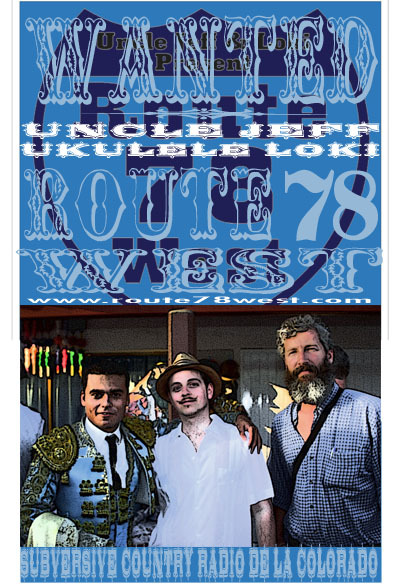 Radio / DJ: Ukulele Loki has worked in radio since 1996. His lifelong passion for non-mainstream music has taken him up many musical rivers and tributaries. He was one of the founding members of Boulder's nationally renowned college station: Radio 1190 KVCU. Over the years he has produced, hosted, and programmed numerous shows including the weekday morning show from 1999 - 2000. In the fall of 2000, he worked briefly for gogaga.com's freeform channel. Over the year's he has interviewed countless artists, musicians, and authors, including Hank Williams III, Daniel Johnston, Irwin Chusid, Douglas Coupland, & Pam Grier. 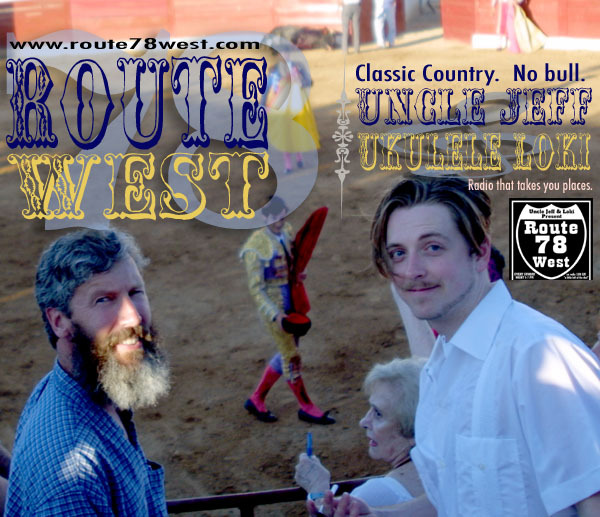 He co-founded his current program, Route 78 West (the world's most eclectic country radio show) with Uncle Jeff in 2000. Most recently, he has produced several spoken memoir and opinion pieces for radio. Ah, the sweet smell of dusty shellac! Ukulele Loki & Uncle Jeff mine the 78 stockpile -- thanks to Eric Allen. 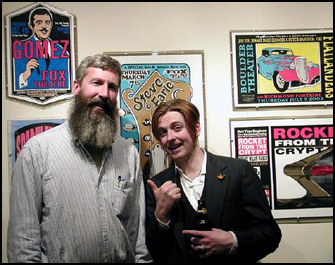 You can hear Loki and co-host Uncle Jeff every Sunday from 10- noon (Mountain time) on Radio 1190, KVCU Boulder. Listen as they spin a collection of honky-tonk, jug-band,old-time, western swing and alt. country. The 78 refers to the78 rpm records the two adore. Archived recordings, podcasts, playlists, and show notes, are available at route78west.com You can also listen live online by visiting Radio 1190's netcast. 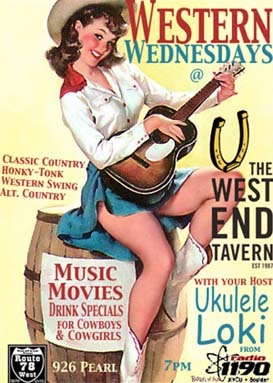 Ukulele Loki is not opposed to spinning live, as evidenced by his weekly music and movie fest at Boulder's West End Tavern. Please note: Western Wednesdays is no more. 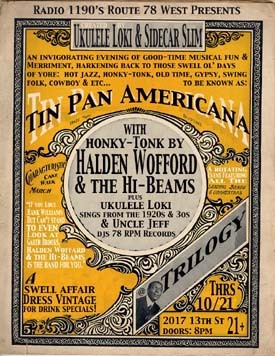 Ukulele Loki: host of "Tin Pan Americana" -- co-created with co-conspirator Sidecar Slim of the Gadabouts -- an evening of live vintage and country inspired entertainment at Boulder's swank Trilogy Wine Bar and Lounge. 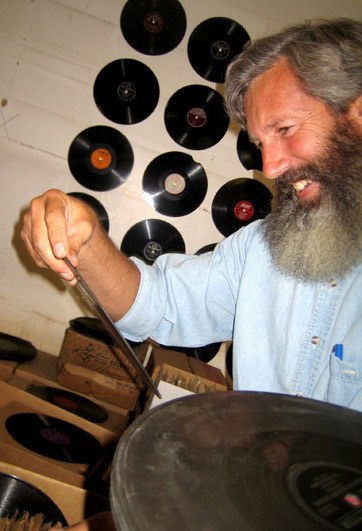 Uncle Jeff was also on hand, spinning LIVE 78 rpm records. Folks came for the music, and listened for radio rebroadcasts!